Having paid in full for my next diving holiday to Bali the day before the bomb went off, it was a little unsettling deciding what to do. Especially since I was taking two of my children with me. After talking it over with my beloved wife we agreed that you can’t just hide away and cancel all your plans. So the next working day I rang the travel agent to make sure all was still go. Apart from having to change airlines, as we had booked onto Air Paradise; a new airline which had now cancelled it launch indefinably, and changing hotels, as ours was situated right behind Paddy’s Bar and had it’s entrance blown up, nothing had changed except for the $100 hike in fees each for the new hotel. We had been to Bali twice within the last 18 months and had always been made to feel very welcome and it’s good to say nothing has changed, if anything its just gotten better. For the last two trips we have intended to go to the Gili Islands off the North West coast of Lombok but had never made it for several reasons, one because we didn’t really have any idea how to get there, the other being a serious lack of time. We had made up our minds to get there at any cost this time. After extensive searching through the internet, we found a few dive shops located on Gili Trawangan the biggest of the three islands. Having settled on Manta Dive as our dive store of choice, Marcus the owner helpfully advised us of the best route to the island. With the ferries cutting back on the days they crossed from Bali to Lombok it was decided to fly across. I pre-booked the flight from Bali to Mataram airport on Lombok, flying with Merpati airlines, via the net. The first flight departed Denpasar at 7:30am and arrived in Mataram at 7:55am, yes that’s only a 25minute flight and cost US$50 return. From there we took a taxi to Telok Nara arriving there at about 8:45am. Be aware that the taxi booking office is just inside the airport doors. This is the place to book a taxi and the price is a set one (approx 48,000rp or US$5 for Telok Nara) depending on where you are going, if you walk outside the airport door you will be set upon by several locals wanting to transport you at double the price. Once at Telok Nara we were picked up by a pre arranged Manta Dive speedboat and arrived at the dive shop in Trawangan at 9am. Marcus greeted us there and directed us to some nice cheap accommodation at the Aldi Homestay. At 35,000rp or US$3.50 a night for a clean room with twin beds, a western toilet and a fan with breakfast included, it was a real bargain. We arrived back at the dive store at 10:45am to prepare for our first dive at Shark Point, a site located on the west side of the island. Transport to the site was by a large outrigger boat with ample room to stand and kit yourself up. Once in the water it was hard not to notice the amount of damage the coral had sustained due to El Nino a few years ago, most was dead, but fortunately there are signs it is springing back to life. This is the site if you want to see turtles. We came across five big Hawksbill turtles within the first ten minutes who didn’t seem to mind us swimming around with them. A bit deeper, around the 25m mark and you are into whitetip shark territory, we saw six during this dive all sitting in the slight current that flowed through the gullie. Due to the current most of the other life tends to hang around the numerous bommies at this site, juvenile ribbon eels, big green moray eels, trevalley, clown anemones and wrasse to name a few. The diving at this site is suitable for all levels starting at 5m and slowly slopping down to 30m, beyond that there is only a sandy bottom. We returned to the resort for lunch and a relaxing rest in the shop front hammocks before heading off to Manta Point located on the southern tip of the island. The current was slight stronger here, but nothing dangerous, the worst thing being the thermoclines that are everywhere and drop the water temperature a good 5 degrees when you pass through them. There are numerous white and black tip reef sharks here but they are very timid and it is hard to get close to them. The coral here is in slightly better condition than at Shark point. After getting our gear together for the night dive we headed off to find something to eat for dinner. Marcus had recommend Vila Ombak a hotel 500m up the beach and we were not disappointed, a superb meal was had by all. The night dive was to be at Meno Wall on the North West side of Gili Meno the second island in the chain, no sooner had we hit the water and we were surrounded by Krill. Thousands of them, they were everywhere and seemed to be attracted to our lights, getting in our hair and ears was a little annoying but it was a sight to see, it was like diving in a soup of krill. Once again the turtles were abundant as were lion fish and moray eels. This is one of the few places around this region I have seen crayfish in packs. We were also treated to a large solitary Barracuda. The coral here seemed to be worst hit of the lot, which is a shame because the dive was great with the damage and you are left to wonder what it was like before the coral died and only hope a full recovery can be made. The following morning we had decided to go snorkelling at the Northern end of the island were the coral is in the best condition and comes all the way into the shore with little or no current. We encountered several turtles here and some barracuda. A duck dive down to one turtle and the temptation was to much. As I reached out to touch it I was reminded why we should look and not touch as it spun around very quickly and took a snap at me, looked me straight in the eye and then continued on. We continued snorkelling for a good 3 hours before heading back for lunch. As we sat in the sunshine on this beautiful island there was thunder and lightning on Lombok about 3km away, and the same back on Bali. We reluctantly left the island later that afternoon to catch the plane back to Bali and wonder why we didn’t make the trip eariler. This is a very large sloping reef, with hilly topography and shallow valleys. Medium to large whitetip Reef Sharks are common in the valleys as are Hawksbill and and other turtles. There are large Scorpionfish, Teira Batfish, Groupers, Large Sweetlips, Trumpetfish, Boxfish, Filefish and sometimes large schools of Humphead Parrotfish. Cuttlefish are common, often seen in large groups of five or more. This a steeply sloping reef with a near-vertical top section. The reef drops to a sandy bottom at about 22m. Soft corals grow all along reef. There are many types of stony corals, including brain, cabbage, star and Acropora. Groupers and sweetlips are seen in very large quantities. Also seen are snappers, angelfish, clownfish and large parrotfish. This is a good place to see a lots of large turtles. Excellent coral rising from a sandy bottom at depth of 35m. There are eight major formations arranged roughly in a figure eight. The channels between the formations and outcrops are impressive, funneling the current and concentrating large number of bigger reef fish into smaller areas. Fish life, particularly in times of strong currents, consists of the larger reef species and schooling species. Snappers and sweetlips are prolific in big schools tight in the coral formations. Parrotfish, angelfish, triggerfish, trevallies and small to medium tuna are quite common. This site is well populated by turtles and there are often large Great and Barred Barracuda. DIRECTIONS: Off the northern shore of Gili Air. Very similar to Simons Reef. There are about 10 major formations, each sculpted with overhangs, outcrops and swim-throughs. The formations show the same excellent amount of corals as at Simon’s reef, and are very often covered in soft coral varieties growing on top of the stony coral outcrops. There are also some very big gorgonian sea fans here. The channels between the formations are as interesting as the formations themselves. You usually see cuttlefish around here. 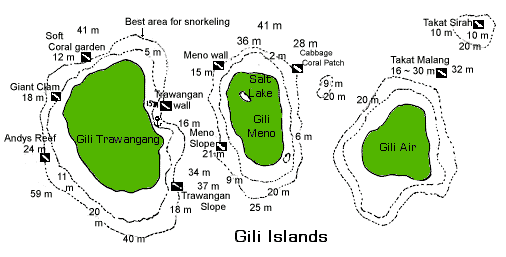 DIRECTIONS: Off the west shore of Gili Trawangang. DIVE INFO: There are sharks here, white tip reef sharks. The dive site has the shallow area coming from the shore (5-6M), and then slopes in a series of ridges. Deepest ridge at around 28M, after that it is just a steep slope to 50+M . As well as the Sharks, Turtle's, Bump heads and occasional Manta, there can also be big groupings of Jacks (Trevalleys) and black Snapper, enough to block out the light.